Loch Moidart, just north of the Ardnamurchan peninsula, is one of Scotland's hidden gems. A shimmering finger of water hidden from view by dramatic mountains and protected from the rigours of the Atlantic ocean by a barrage of craggy islands. Its rocky shores are well worth seeking out and the best way to enjoy its peace and tranquility is on foot. At the head of the loch, stocky Castle Tioram stands guard on the south approach. Constructed in the 13th century to protect the area from attack, it witnessed centuries of clan battle before being burned out in 1715. Built upon a small offshore island, it can be visited when the tide is out and offers an impressive climax to a day out in one of the most beautiful parts of Scotland. The track leaves the A861 in Blain at a metal gate which carries a notice reading: 'Loch Blain, Private Fishing'. Go through the gate and the track climbs through a tranquil woodland of beech, oak, silver birch and holly, a bushy carpet of rhododendron and bracken lining the wayside. Continue up and a short way on a locked gate straddles the route. A stile has been provided. Cross this and carry on along the track, bearing right to cross a small burn before rising past a fenced enclosure. Just beyond leave the main track where it curves right and follow a grassy track. The track leads into a small woodland of silver birch where it ends and a path continues, the way littered with stones. It is fairly muddy initially but improves as it gains height and emerges on to open hillside, climbing to Loch Blain. Continue until the lochan is reached. The first clue to the lochan's existence is a small stone dam at its southern end. Beyond this the smooth lily covered gloss stretches out to a small woodland of tall pine trees on the far bank, all around craggy hillsides slope back to frame the calm serenity of the spot. The path curves round the east shore, passing between Loch Blain and a smaller neighbouring pond. Follow the way up to the next junction, marked by a lone tree. At the junction, if for any reason you need an escape route, carry straight on up here and the path descends to the road. To continue the walk, turn right and the path rises through bracken and heather to its highest point below Beinn Bhreac. When the top is reached, the descent begins past a couple of cairns. Then prepare for spectacular views over Loch Moidart and craggy Glenuig Hill beyond. You can see the A861 road as it climbs steeply from the far shore of Loch Moidart into Glen Uig, joining the main Fort William to Mallaig road further north. The path drops to the right of a cluster of ruined cottages. The lochside path is just a short way on. Keep your eyes peeled for the junction as it is easy to miss. There is a small cairn in the bracken on the left hand side and a tall oak tree. However, if accidentally you overshoot, stop when the path begins to rise through a small grassy valley between the hillside on the right and a knoll on the left and retrace steps - it is much more obvious heading west. The path then meanders through woodland above Loch Moidart, offering plenty of opportunity to soak up the scenery. It stays close to the shore and there are one or two sections where some easy scrambling is needed to negotiate boulders and rocks. Take care on exposed stone which can be slippery when wet. As you head west, the path drops down on to an open rock ledge that skirts along just above the water. Be careful not to go to close to the edge here but keep your eyes peeled for otters swimming in the sea loch. A short way on from the ledge, the path curves left around the headland and Castle Tioram suddenly looms into view. Follow the path right round and just beyond a gate it emerges on to a grassy plain on the shore opposite the castle. If the tide is low, the castle can be reached on foot. Head across the grass and then over open beach separating the island on which the castle sits from the mainland. Climb up over the grassy path leading to the castle and you will find an entrance on the northside of the huge stone structure. When you've finished exploring the ruin, cross back to the coastal path and head south to a car park at the top end of the public road where an information board includes pictures of how the castle would have looked when it was in use. There are also fine views from here to the castle itself. Map OS Landranger 1:50,000 sheet 40. 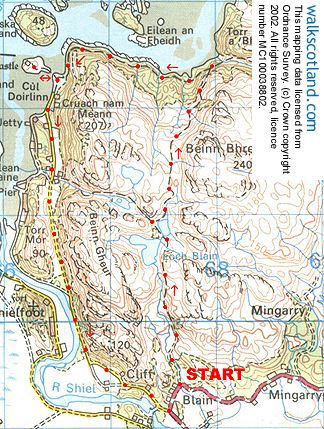 Start Track end at Blain, half a kilometre north of Shiel Bridge (grid ref NM 677694). Parking Space for several cars on the roadside. Grading Path over open hillside and along lochside, rough and muddy in places. This route is suitable for all fairly fit walkers and capable children. Choose a good clear day for best results. Possibility of some cattle grazing on the open hillside so dogs may need to go on lead.